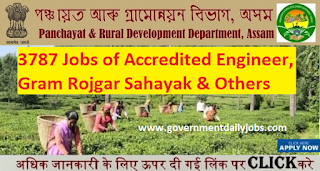 NOTIFICATION: Panchayat & Rural Development Department (PNRD) Assam, Guwahati (A Government of Assam) inviting online applications for filling up 3787 vacant posts of Accredited Engineer, Gram Rozgar Sahayak, Computer Assistant, Account Assistant, District MIS Manager, Gaon Panchayat Coordinator, Block MIS Manager (PMAY-G) under Mahatma Gandhi National Rural Employment Guarantee Act MGNREGA) and Pradhan Mantri Awas Yojna (Gramin) under the Department of Panchayat and Rural Development, Assam on contractual basis from eligible and interested willing candidates. It is latest & good information for unemployed personnel those who are looking for these new Jobs in Government sector & other organizations. Job seekers, who wish to apply for these vacancies regarding Recruitment 2017, must have passed 10th/ XII/MCA/ BCA /Diploma/HSSC/ SCAI SCITI PGDCA with a required experience if asked. Applicant’s upper age should be as per Govt. rules and age relaxation is applicable to all reserved category candidates i.e.SC/ST/OBC/PWH /Ex Servicemen/Women candidates etc. 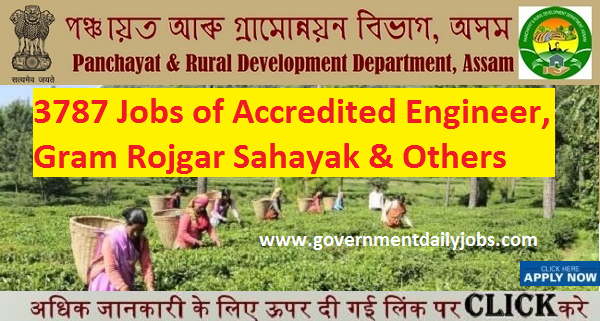 NO OF POSTS: 3787 vacant posts of Accredited Engineer, Gram Rozgar Sahayak, Computer Assistant, Account Assistant, District MIS Manager, Gaon Panchayat Coordinator, Block MIS Manager (PMAY-G) in Panchayat & Rural Development Department (PNRD) Assam, Guwahati. 1. Accredited Engineer: 1850 Posts. 2. Gram Rozgar Sahayak: 520 Posts. 3. Computer Assistant: 60 Posts. 4. Account Assistant: 46 Posts. 5. District MIS Manager (MGNREGA): 09 Posts. 6. Gaon Panchayat Coordinator: 1083 Posts. 7. Block MIS Manager (PMAY-G): 219 Posts. 1. Accredited Engineer: A passed of Diploma in Civil Engineering from any recognized Board/Institute/University may be given preference. 2. Gram Rozgar Sahayak: A passed of HSSLC from any recognized Board/Institute/ University. Candidates from Science & Commerce stream may be given preference. 3. Computer Assistant: A passed of HSSLC from any recognized Board/Institute/University and processing basic computer & Internet skills. 4. Account Assistant: A passed of HSSLC from any recognized Board/Institute/University under Commerce Stream. 5. District MIS Manager (MGNREGA): A passed of MCA/BCA from any recognized Board/Institute /University and experience in the related field is desirable. 6. Gaon Panchayat Coordinator: A passed of B.Com from any recognized Board/Institute /University. 7. Block MIS Manager (PMAY-G): A passed of SCAI SCITI PGDCA from any recognized Board/ Institute /University with 1 year experience. 2. Gram Rozgar Sahayak: Rs.8,4001/-. 5. District MIS Manager (MGNREGA): Rs.25,0001/-. 6. Gaon Panchayat Coordinator: Rs.9,5001/-. 7. Block MIS Manager (PMAY-G): Rs. 10,0001/-. AGE LIMIT: Candidate’s required age should be in between of 21 years - 35 years as on 01-01-2017 for PNRD Assam Recruitment 2017 Apply 3787 Accredited Engineer, GPC Vacancy. POST RESERVATION: All reserved category candidates ie. SC /ST /OBC / PWD / Women/Ex Servicemen /Widows etc (as applicable) are being selected for said post/s as per existing Govt. policy/rules. 3562 vacant posts of Probationary Officers (PO) / Management Trainees (MT) through IBPS PO / MT VII conducted by Institute of Banking Personnel Selection (IBPS). LAST DATE TO APPLY: From 16-08-2017 to 05-09-2017. SELECTION PROCESS: Applicants who are screened for applicability /eligibility are being selected as per organization policy/rules depending on the basis of their performance in written exam, Skill test and Document verification. HOW TO APPLY: For said posts (PNRD Assam Accredited Engineer Panchayat Coordinator & Other 3787 Vacancy) eligible, willing and interested candidates may apply through online at official website up to 31-08-2017. Applicants must retain a hard copy for future reference. 2. On the home page, click on the advertisement link. 3. Download the complete PNRD Assam Recruitment 2017 Notification. 4. Read the official advertisement carefully. 5. If you are eligible for the Assam PNRD Engineer Jobs 2017, click on the apply online link. 6. Fill in the Assam PNRD Application form 2017 with the proper details. 7. Upload the scanned documents if necessary. 8. Recheck the entered information and click on submit button. 9. Download the copy of the Assam PNRD Engineer application form for future reference. CONTACT ADDRESS: Panchayat & Rural Development Department (PNRD), Assam Secretariat, Dispur, Guwahati, Assam-781006- Guwahati. CONCLUSION: Panchayat & Rural Development Department (PNRD) Assam, Guwahati invites online application for the recruitment of 3787 vacant posts of Accredited Engineer, Gram Rozgar Sahayak, Computer Assistant, Account Assistant, District MIS Manager, Gaon Panchayat Coordinator, Block MIS Manager (PMAY-G) on regular basis from Indian residents who are eligible & interested; candidates can apply through online application up to 31-08-2017. LAST DATE TO APPLY: 31-08-2017 for PNRD Assam Accredited Engineer Panchayat Coordinator & Other 3787 Vacancy.